If you need to travel to Chicago (mainly) next winter season 2019/2020 you may appreciate currently running promotion of Oneworld partners British Airways and American Airlines. Based on their service you can book cheap non-stop flights from London to Chicago from £254! This is for a roundtrip ticket inclusive of all taxes and fees, onboard meals and hand bag. There is no checked luggage in base fare only available for extra fee.. If interested in this deal with Oneworld airlines you will find the cheapest flights when departing from London to Chicago in May or end of October 2019 to March 2020. Min stay over the weekend. Max stay 12 months. Base fare does not include bag in hold. Fare class is “O“. British Airways promo sale is running till 19th of April or until sold out..
You can book your accommodation in Chicago via Booking.com. Also you can further discount your hotel when using one of following promo codes. 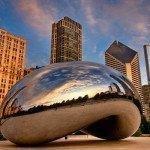 Booking sample of cheap non-stop flights from London to Chicago from £254! As per above link you would fly from the United Kingdom to this city in USA on Sunday, 10th of November. Inbound from North America back to London Heathrow on 17th of November 2019.